ezbuy is not a strangers among Ecommerce Store online shopping platform , ezbuy is created to provide professional online shopping services that established in 2010 by a group of aspiring entrepreneurs , ezbuy provide shopping service from China , Taiwan , USA and local for Business Coverage in Singaporean , Malaysian , Indonesia and Thailand . ezbuy Trying their best to provide excellence service while keep focusing more on local demands . ezbuy would like to transport anything or everything to everyone that their serve . Nowadays not like those days , Technology makes life easier , service brings more comforts and dedicated to provide better service , ultimately , ezbuy hope everyone can create better lifestyle , simple and convenient . Jing Dong (JD.com) known as the largest Internet company in China's income. In July 2017, Jingdong was once again listed in Fortune Global 500, ranked 261th, becoming the highest ranked Chinese Internet company, ranking second only to Amazon and Alphabet in the world, ranking third among Internet companies . And this e-commerce shopping products can be found at ezbuy platform . 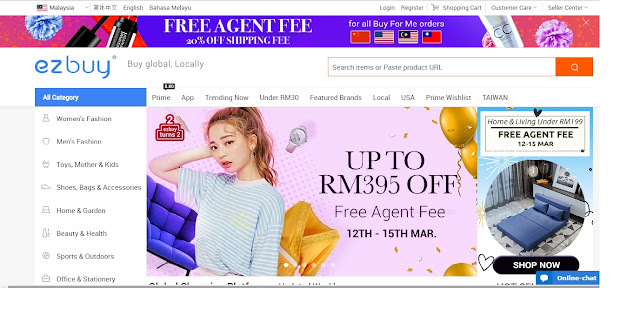 To view the Product of Jing Dong (JD.com) in ezbuy , Kindly on link that given : https://ezbuy.my/JingDong . More than forty thousand of product can be purchase in ezbuy , You name it they have it .
" mogujie " is a women's fashion consumption platform . It serves different female users by integrating existing resources including e-commerce , community content and more . " mogujie " created apps that targeted at youngters with the user population is aged between 18-23 . To view the Product of mogujie (mogujie.com) in ezbuy , Kindly on link that given : https://ezbuy.my/mogujie . It is a place of shopping paradise for ladies , Get into the latest trend at mogujie .